Theodoros I Komnenos Laskaris (Theodore I Comnenus Lascaris) (Greek: Θεόδωρος Α' Λάσκαρις, Theodōros I Laskaris; c. 1174/5 – 1221/August 1222) was the first Emperor of Nicaea (reigned 1204–1221 or 1205–1222). Theodore Laskaris was born to the Laskaris, a noble but not particularly renowned Byzantine family of Constantinople. He was the son of Manuel Laskaris (b. c. 1140) and wife Ioanna Karatzaina (b. c. 1148). 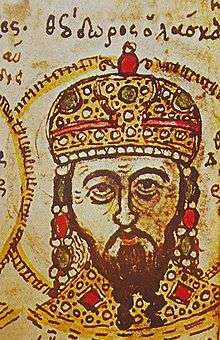 He had four older brothers: Manuel Laskaris (died after 1256), Michael Laskaris (d. 1261/1271), Georgios Laskaris and Constantine Laskaris (died after March 19, 1205), Emperor of Byzantium (1204–1205); and two younger brothers: Alexios Laskaris, Latin military leader against the Bulgars who fought with the French against John III Doukas Vatatzes and was imprisoned and blinded, and Isaakios Laskaris. William Miller identified the wife of Marco I Sanudo as the sister of Theodore, based on his interpretation of the Italian sources. However, Mihail-Dimitri Sturdza rejected this identification in his Dictionnaire historique et Généalogique des grandes familles de Grèce, d'Albanie et de Constantinople (1983), based on the silence of Byzantine primary sources. In 1198/9, Theodore married Anna Angelina, daughter of the Byzantine Emperor Alexios III Angelos and Euphrosyne Doukaina Kamatera; she was the widow of her cousin the sebastokratōr Isaac Komnenos. By this marriage he was brother-in-law of Eudokia Angelina. Theodore later distinguished himself during the sieges of Constantinople by the Latins of the Fourth Crusade (1203–1204). He remained in Constantinople until the Latins actually penetrated into the city, at which point he fled across Bosphorus together with his wife. At about the same time his brother Constantine Laskaris was unsuccessfully proclaimed emperor by some of the defenders of Constantinople. 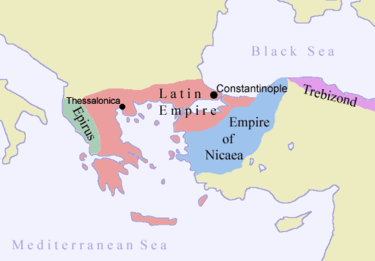 In Bithynia Theodore established himself in Nicaea, which became the chief rallying-point for his countrymen. At first Theodore did not claim the imperial title, perhaps because his father-in-law and his brother were both still living, perhaps because of the imminent Latin invasion, or perhaps because there was no Patriarch of Constantinople to crown him Emperor. In addition, his own control over the Anatolian domains of the Byzantine Empire was challenged, by David Komnenos in Paphlagonia and Manuel Maurozomes in Phrygia. It was only after defeating the latter two in 1205 that he was proclaimed Emperor and invited Patriarch John X Kamateros to Nicaea. But John died in 1206 before crowning Theodore. Theodore appointed Michael IV as the new Patriarch and was crowned by him in March 1208. In the meantime, Theodore had been defeated by the Latins at Adramyttion (Edremit), but soon afterwards the Latins were themselves defeated by Kaloyan of Bulgaria at the Battle of Adrianople. This temporarily stalled the Latin advance, but it was renewed by Emperor Henry of Flanders in 1206. Theodore entered into an alliance with Kaloyan and took the offensive in 1209. The situation was complicated by the invasion of Sultan Kaykhusraw I of Rum at the instigation of the deposed Alexios III in 1211; however, the Nicaeans defeated the Seljuk army at the Battle of Antioch on the Meander where Theodore Laskaris killed the sultan in combat. Although the danger from Rum and Alexios III was thus neutralized, Emperor Henry defeated Theodore in the same year, and established his control over the southern shores of the Sea of Marmara. In spite of this defeat, Theodore was able to take advantage of the death of David Megas Komnenos, the brother of Emperor Alexios I of Trebizond in 1212 and to extend his own control over Paphlagonia. In 1214 Theodore concluded a peace treaty with the Latin Empire at Nymphaion, and in 1219 he married Marie de Courtenay, a niece of now deceased Emperor Henry and daughter of the current regent, Yolanda of Flanders. In spite of predominantly peaceful relations, Theodore attacked the Latin Empire again in 1220, but peace was restored. Theodore died in November 1221 and was succeeded by his son-in-law John III Doukas Vatatzes. At the end of his reign he ruled over a territory roughly coterminous with the old Roman provinces of Asia and Bithynia. Though there is no proof of higher qualities of statesmanship in him, by his courage and military skill he enabled the Byzantine nation not merely to survive, but ultimately to beat back the Latin invasion. After Anna Angelina died in 1212, Theodore took Philippa of Armenia (1183-aft. 1219) as his second wife. She was a daughter of King Ruben III of Armenia; this marriage was annulled a year later and they divorced in 1216. Gardiner mentions the theory that Ruben wanted to marry his daughter to another, and sent his niece in her place; once Theodore found he had been duped, he sent her and the son born to them, Constantine Laskaris, born in 1214, back to Cilicia. Theodore's third wife was Maria of Courtenay (1204-September, 1222), whom he married in 1219. She was the daughter of Emperor Peter II of Courtenay and Empress Yolanda of Flanders, but they had no children. This article incorporates text from a publication now in the public domain: Chisholm, Hugh, ed. (1911). "Theodore Lascaris". Encyclopædia Britannica. 26 (11th ed.). Cambridge University Press.